System consisting of NIMBLE TRICKY carabiner, semi-rigid 35 cm long polyamide sling and FIXIT rubber. TRICKY is a useful device that allows the carabiner to be easily clipped into a far piece of protection, otherwise out of reach. 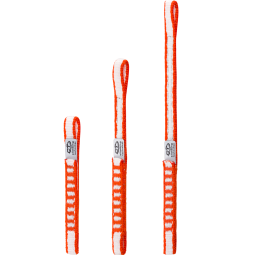 Long quickdraw, for alpine routes and sport climbing, ideal to avoid rope rubbing or to facilitate the passage over roofs, corners and traverses. Stabilizing clip made of strong polyamide, designed to be installed onto a ø 10 mm, oval, quick link in indoor-climbing quickdraws. FIXGYM prevents the quick link from rotating around the anchor or the sling, keeping them correctly aligned. Extremely robust, ergonomic and lightweight quickdraws with elevated workloads, ideal for climbing on-sight, for intensive use and for working a route. Extremely robust, ergonomic and lightweight quickdraw with elevated workloads, ideal for sport climbing, for intensive use and for working a route. Extremely robust, ergonomic and lightweight quickdraw with elevated workloads, equipped with an ergonomic and robust polyamide sling in variable widths. Lightweight and handy quickdraw equipped with hot-forged compact sized carabiners with catch-free nose, ideal for working a route. Lightweight, strong and durable quickdraw equipped with lower carabiner with special wear-proof hard coat anodizing, ideal for intense and prolonged use. Strong and durable quickdraw, equipped with an ergonomic and robust polyamide sling in variable widths (25/16 mm). Classical multipurpose quickdraw with excellent quality/price ratio and equipped with classic shape carabiners. Classical multipurpose quickdraw equipped with a robust 16 mm polyamide sling and a new FIXIT rubber fastener. Multipurpose quickdraw equipped with an ergonomic and robust variable width polyamide sling and a new FIXIT rubber fastener. Classical multipurpose quickdraw with mixed combination: upper carabiner with straight gate and lower carabiner with wire gate. Multipurpose quickdraws equipped with classic shape carabiners with wire gate and with a lightweight and durable Dyneema sling. 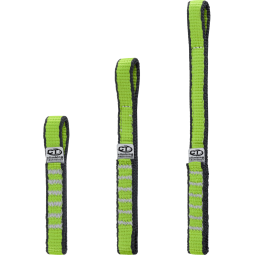 Ultra-light and compact quickdraws equipped with compact sized carabiners and with a durable and lightweight 10 mm Dyneema sling. Compact, ultra light and versatile quickdraw equipped with 60 cm long Dyneema 10 mm sling. Fxed quickdraw for indoor gyms and outdoor projects, equipped with an ergonomic and shaped hardened steel carabiner and with an ergonomic and robust polyamide sling in variable widths. Fixed quickdraw for climbing gyms and outdoor projects, equipped with an ergonomic and robust variable width (25/16 mm) polyamide sling and with a hardened and zinc-plated steel carabiner. Classic quickdraw ideal for sport climb and mountaineering beginners, equipped with classic shape, traditional gate carabiners. Extremely light and durable 10 mm Dyneema quickdraw sling available in lengths of 12 cm, 17 cm and 22 cm. Lightweight and durable 11 mm Dyneema quickdraw sling available in lengths of 12 cm, 17 cm and 22 cm. Robust and durable 16 mm polyamide quickdraw sling available in lengths of 12 cm, 17 cm and 22 cm. Ergonomic, robust and durable variable width (25 / 16 mm) polyamide quickdraw sling available in lengths of 12 cm and 17 cm. New innovative shaped rubber fastener for quickdraw slings (patent pending). It secures the lower carabiner of the quickdraw to the sling, preventing the accidental rotation and keeps it on the axis. It also protects the sling from wear and tear. 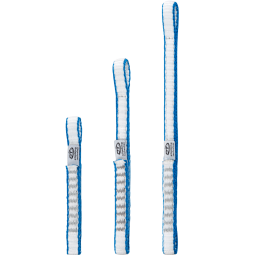 Dyneema quickdraw for ice screws that makes it simpler to wind-in the ice screw and prevents it dropping during extraction.